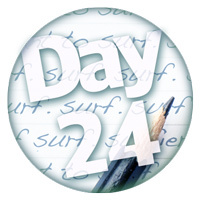 Welcome to the final seven days for our 30 Days to Waves challenge. We’re so proud you’ve stuck with us to Week Four! As you’ve learned by now, this isn’t an intense cross-training routine that’ll have you begging for relief. Our challenges are bite-sized appetizers to kickstart the journey ahead. The 30 Days to Waves challenge will focus on three areas of your well-being. Start the conversation, then reflect and journal your thoughts. Add quick workouts to your schedule to get blood flowing and prepare your body for adventure. Little by little, reduce the toxics in your diet and increase your intake of superfoods. Anyone is welcome to join the 30 Day to Waves challenge, so find a friend and let’s get started. Week Four challenges start here. Revisit the list you made at the beginning of the 30 Days to Waves challenge. What have you learned about yourself? Do your goals seem more achievable now? Why? Warm up with two dozen jumping jacks, then 10 modified surfer burpees–land in your surf stance. Repeat to build muscle memory. Finish with 10 minutes of hamstring, quad, and arm stretches. At night before you drift off to sleep, visualize yourself catching your next wave and popping up into position. Let’s do shots! Wellness shots, that is. Squeeze the juice of one lemon into your favorite shot glass, finely grate a half teaspoon of fresh ginger, stir in and add water to fill. 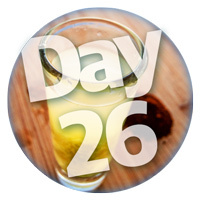 Sprinkle one shake of cayenne pepper on the back of your hand, say “dropping in!”, lick the pepper, and down the shot. Bet you feel better already. It’s balance day again. Get your back and arms in paddling shape by doing 10 reps for three sets of yoga push-ups, the total body workout that’s half yoga pose, half pop-up. What’s a yoga push-up? Tap here. 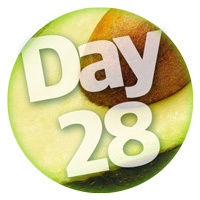 Add avocado to your green smoothie today to get nearly 20 vitamins, minerals, and phytonutrients. Spike it with immunity boosters like grated ginger and cayenne pepper. For recipe ideas, tap here. Put on your headphones and just press play! Cue up your favorite dance tune and shake it! Nothing burns calories like rockin’ out. For a list of classics, tap here. 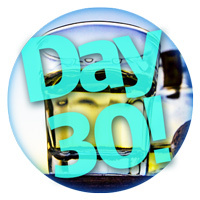 You made it to Day 30 of the 30 Days to Waves challenge! Only one thing left to do–celebrate with a shot of tequila! But don’t celebrate with just any tequila. For a list of excellent choices, from reasonably priced reposado to five-star añejo, tap here. ¡Salud! Congratulations! You made it outside. Now scan the horizon and get ready for waves. Explore 30 Days to Waves Weeks One, Two, and Three. Photos by Camilla Fuchs and Las Olas. GetDressedandGo.com is our new website for traveling women of all stripes. Stay in touch! We’ll be with you every paddle of the way!